The staff of a federal panel that oversees plans for monuments in the nation's capital is recommending changes in the design for a memorial honoring President Dwight D. Eisenhower. The National Capital Planning Commission is set to consider building plans Thursday for architect Frank Gehry's design for the memorial. But after months of review, the commission's staff objects to the scale and configuration of stainless steel tapestries that would frame a memorial park honoring Eisenhower. Gehry has proposed large metal tapestries depicting the Kansas landscape of Ike's boyhood home. 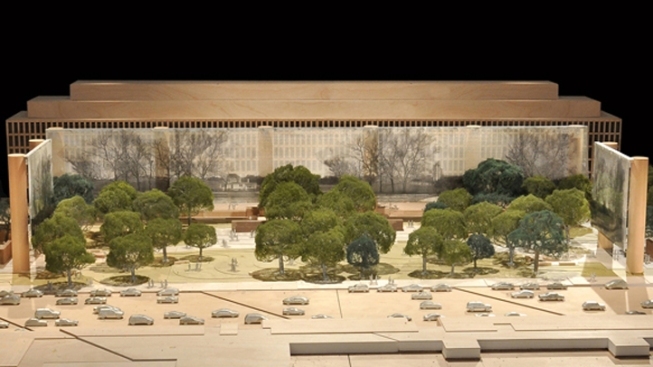 Statues of Eisenhower as president and World War II general would stand at the park's center. A rejection by the commission could force design changes. On Monday, Eisenhower's hometown of Abilene, Kan., endorsed Gehry's memorial concept, saying it honors Eisenhower's roots.